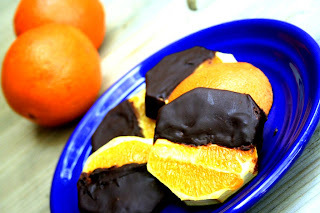 Dark chocolate-covered oranges. Breakfast of champions. I'm in sunny California today folks and on gorgeous days like this I can almost taste summer. To me, summer is fruit season. And while I love eating fruits on their own, unrefrigerated and with my bare hands, I love dipping them in chocolate. I had this for breakfast today. Wait, let me justify having chocolate for breakfast. 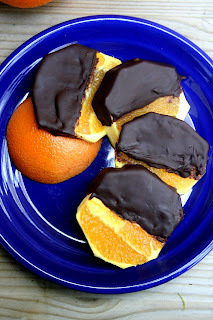 Some chocolate-covered things pile on the pounds (like chocolate-covered graham crackers), but this no-bake dark chocolate-covered oranges can be really good for you. A, it's made with dark chocolate so it's not only high in anti-oxidants; it contains less sugar than regular milk chocolate. B, oranges contain a feast of vitamins and they're a solid source of potassium, iron, and fiber. What better way to start the morning? It's an interesting thing when a burst of citrus meets bold, bittersweet chocolate. You'll see. 1. Melt chocolate using a double boiler or a microwave. If using microwave, melt chocolate on high for 30 seconds and stir, then melt them for another 30 seconds. Careful not to burn the chocolate! 2. Peel the orange and slice it into fours or eights, whichever way you like. Dip half of the orange in dark chocolate and let cool. I left a lot of the white pith in because that's where the bioflavonoids are (the most nutritious part of the orange!) but that's entirely up to you. I have some very exciting news to share but I can't tell you just yet. *squeals* But I will, very soon!! i like this kris. easy!